Wizards of the Coast. Hardcover. 0786916575 Item in good condition. Textbooks may not include supplemental items i.e. CDs, access codes etc... . Good. Wizards of the Coast. Hardcover. GOOD. Spine creases, wear to binding and pages from reading. May contain limited notes, underlining or highlighting that does affect the text. Possible ex library copy, thatâll have the markings and stickers associated from the library. Accessories such as CD, codes, toys, may not be included. Wizards of the Coast, 2000. Hardcover. Acceptable. Disclaimer:A readable copy. All pages are intact, and the cover is intact. Pages can include considerable notes-in pen or highlighter-but the notes cannot obscure the text. At ThriftBooks, our motto is: Read More, Spend Less.Dust jacket quality is not guaranteed. Wizards of the Coast, 2000. Hardcover. Good. Disclaimer:A copy that has been read, but remains in clean condition. All pages are intact, and the cover is intact. The spine may show signs of wear. Pages can include limited notes and highlighting, and the copy can include previous owner inscriptions. At ThriftBooks, our motto is: Read More, Spend Less.Dust jacket quality is not guaranteed. Wizards of the Coast, 2000. Hardcover. Good. Disclaimer:A copy that has been read, but remains in clean condition. All pages are intact, and the cover is intact. The spine may show signs of wear. Pages can include limited notes and highlighting, and the copy can include previous owner inscriptions. The dust jacket is missing. At ThriftBooks, our motto is: Read More, Spend Less. Wizards of the Coast, 2000. Hardcover. Good. Disclaimer:A copy that has been read, but remains in clean condition. All pages are intact, and the cover is intact. The spine may show signs of wear. Pages can include limited notes and highlighting, and the copy can include previous owner inscriptions. An ex-library book and may have standard library stamps and/or stickers. At ThriftBooks, our motto is: Read More, Spend Less.Dust jacket quality is not guaranteed. Wizards of the Coast, 2000-10-01. First Edit. Hardcover. Very Good. Wizards of the Coast. Used - Good. Ships from Reno, NV. Former Library book. Shows some signs of wear, and may have some markings on the inside. 100% Money Back Guarantee. Shipped to over one million happy customers. Your purchase benefits world literacy! Wizards of the Coast, October 2000. Hardcover . Readable. Between the Covers Bookshop sells gently used books at 55-85% off original retail price. Wizards of the Coast, 2000-10-01. Book Club Edition. Hardcover. Very Good. Hardcover in Very Good condition. Pages are clean. Binding is tight. Jacket in Very Good condition. Book Club Edition. Wizards of the Coast. HARDCOVER. 2000. 0786916575 :Binding:HardcoverVendor: Wizards of the CoastSubject:Fiction | Fantasy | General . G.
Wizards of the Coast. Used - Good. Good condition. Very Good dust jacket. Renton, WA: Wizards of the Coast, 2000. 1st Edition 1st Printing. Hardcover. Fine/Near Fine. 8vo - over 7¾ - 9¾" tall. First Printing: October 2000. The dust jacket has two minor closed tears to the head of the spine. The book is like new. Wizards of the Coast, 2000. First Edition. Hard Cover. Near Fine/Near Fine. First edition. An exceptional copy. 2000 Hard Cover. We have more books available by this author!. 348 pp. 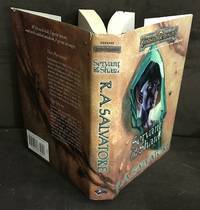 "Servant of the Shard is the latest offering from New York Times bestselling author R.A. Salvatore, best known for his immensely popular Forgotten Realms novels. The Crystal Shard will be featured in an upcoming computer game, Icewind Dale, from Interplay. The dark elf Jarlaxle is bent on becoming all-powerful. 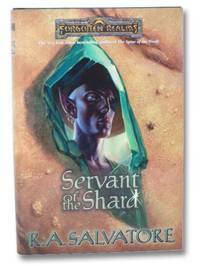 He gets his greedy hands on the Crystal Shard, but soon the evil artifacts demonic force overcomes him. 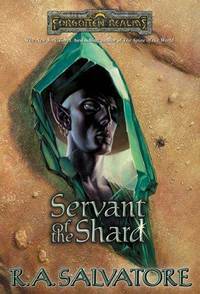 His assassin compatriot, Artemis Entreri, tries to help him break free, but the dark power of the Shard is too mighty. With time running out, they seek the assistance of the virtuous Cadderly. Wizards of the Coast, 2000-10. Hardcover. Very Good. A clean, crisp and unread copy. Wizards of the Coast, LLC. Used; Very Good. Wizards Of The Coast 2000 Hardcover. Book is in excellent condition, with clean unmarked pages. Jacket has a one half inch tear at top of front flap. Book Condition: Very Good Jacket Condition: Very Good . 2000. HARDCOVER.